Last week’s announcement of the official clearance for the gifting of the French Mirage IV aircraft to the museum generated a huge amount of interest from both our followers and the international media. In order to answer some of the many things we’ve been asked about the Mirage, here’s a Mirage IV FAQ we’ve collected together that will hopefully answer some of the most frequently asked questions. What exactly is a Mirage IV? The Mirage IV was the French answer to the Cold War threat and a prime element of the nuclear triad deterrent comprising submarine launched missiles, intercontinental ballistic missiles and supersonic nuclear bombers. Unlike the Mirage IIIE fighter we already have at the museum, the Mirage IV is a lot bigger, measuring 77 ft in length with a wingspan of almost 39ft. What model of Mirage IV is it? Ours is to be a IVA and is serial number 45 of 66 produced in total. Where is it right now? The aircraft is currently in protective storage at a military base near Paris. Where has it been on display? It was previously on display at the Cite des Sciences, France’s huge science museum in Paris. Why did the Mirage IVA leave the Cite des Sciences Museum? They wanted to replace it with the latest Rafale jet. Will it run live like some of our other jets? The Mirage is complete and our Aircraft Engineering Team plus our associates from France and Armée de l’Air will be considering how far to bring it back to original condition. How will you transport it? The Museum is paying all costs and the details and transportation have already been arranged by our French Supporters. It will come by road and ship. Several French companies and one UK company have generously helped fund the project. We will post more details closer to the time. 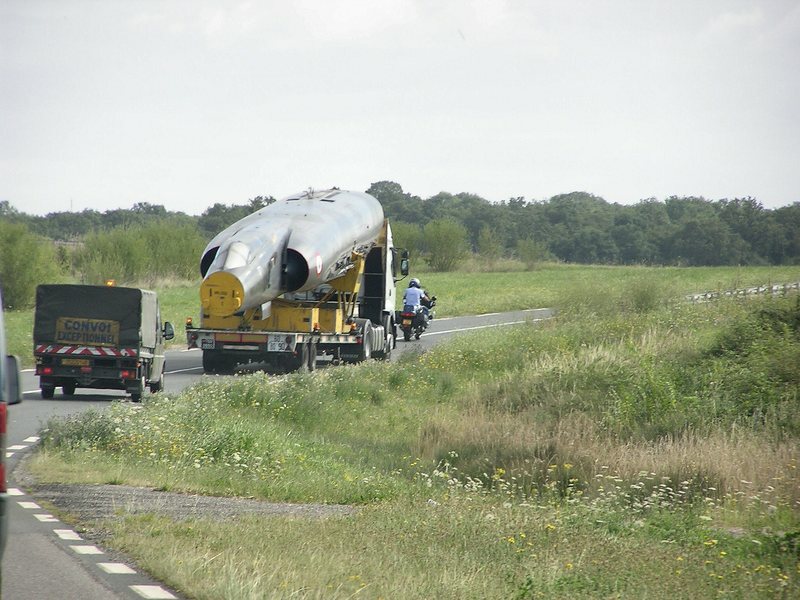 Transporting a Mirage IV by road will be a big task. What is ‘unique’ about the announcement? Several have commented that it is the first time a nuclear bomber has been gifted to a non-governemental museum. This is incorrect, as there a various B52 bombers in private collections, plus of course, the museum is home to Victor XL231. What is unique is that it is the first time the French government have released a Mirage IV to a private museum, outside of France. Are there any other Mirage IVAs preserved? A gate guardian at Merignac – the base where the 2 Elvington Squadrons returned to in 1945. (346) “Guyenne” and (347) “Tunisie” are still wings of the Armée de l’Air and flying Rafales (bomber versions and fighters). There is a third at the Musee de Air Espace at Le Bourget. What’s the reason for wanting to have this aircraft at the Yorkshire Air Museum? We didn’t request it, it was initially suggested by one of the French veterans direct to the French Government and then offered by the French Government to us as part of the closer ties with UK and it’s historic connection with RAF Elvington. Why did the negotiations take so long? Initially it was thought that it may have to be transferred to UK direct from one government to another or from French Air Force to Royal Air Force and then “loaned” to the Museum. As the reputation of the Museum has grown following the significant Anglo/French events we have organised and supported, both in France and UK, and now that the EU has confirmed The Allied Air Forces Memorial is at Elvington, the French Government felt confident in transferring it directly to us. The Museum is nationally accredited (No.66) under DCMS and is ostensibly part of the National Collection with strict rules regarding care and conservation. The biggest question of all, when will it arrive? Will it be this year? It was hoped to be at Elvington in time for The Allied Air Forces Memorial Day on September 4th this year as there will be several veterans receiving the Legion d’Honneur by the French Govt., and we shall have over 16 countries represented this year including Russia, USA etc. That timescale is highly unlikely, but we do hope to have it with us this year. One thing is certain, we will be sure to keep everyone updated on the progress both on our social media channels and via our blog here. Be sure to follow us on your social media channel of choice and keep checking back on the website for more news. Mirage IV breaks down into sub assemblies. Even so, it’s still big…. I don’t want to sound like a pain in the neck but there is another Mirage IV P on display at the CAEA. You’re quite correct Mathia. As we said in the blog post, this is the first Mirage IV outside of France. Another 7 months along and no indication of the Mirage’s arrival.